The peaceful morning of Saturday, July 28th, dawned bright and sunny. The incessant rains that had showered down upon South Bound Brook, NJ, for the entire week, had washed clean the streets, curbs and byways, leaving the entire city sparkling, and ready to meet this most important day in the life of the Ukrainian Orthodox Church. This day would expand beyond the confines of human comprehension in its significance. This day would bind the past, present and future for eternity. This day would celebrate our ancestors, strengthen our families, and forge new relations for the future. O Lord, save Thy people and bless Thine inheritance. Grant victories to the Orthodox Christians over their adversaries; and by the virtue of Thy Cross, preserve Thy habitation! At that very moment, the procession in New Jersey, which celebrated the 100-year anniversary of the founding of the Ukrainian Orthodox Church of the USA, was joined by a procession of thousands in Kyiv, as the faithful walked behind their clergy and hierarchs, who wore the same golden vestments, to celebrate the 1,030th anniversary of the baptism of Ukraine. 1,030 years ago, St. Prince Volodymyr having sent emissaries throughout the world to investigate various Faiths and religions, had found God in Orthodoxy, and his people, and nation followed him in to the Church. That Faith has been guarded and lovingly passed from generation to generation over the centuries, having spread throughout the world, as the faithful found it necessary to flee their homeland. One hundred years ago the world was in turmoil. The first World War had just ended, leaving behind devastation and hardship. The Soviet system was just taking root, further bringing adversity, subjugation, and terror to the lands of Eastern Europe. It is from this chaos, that our ancestors packed their icons and Bibles which were systematically being confiscated and destroyed, and with trust in the Lord and hope in their hearts, they took their first step off the land of their birth and carried the bright torch of the Orthodox Faith, and the traditions of the Ukrainian people, across the lands and oceans to safe haven in the United States of America. These early immigrants, descendants of the faithful who were baptized in the River Dnipro over 1,000 years ago, now had the responsibility of passing the torch of the Christ’s love to the next generation, to build a Church in which their descendants could worship freely without persecution. These early immigrants proved to be worthy of the momentous task before them, having rolled up their sleeves and immediately worked to organize and preserve their Faith. A breeze blew from the west, cascading slowly over the cemetery, winding its way among the tombstones of those early immigrants, and as if it was one huge sigh of the souls who lay there, It blew around the church, and tickled the cheeks of the faithful who stood today in prayer to worship God, to pray for the world, and to honor them who had sacrificed to preserve their Faith and establish this Church for the salvation of future generations. The youth of those future generations were the ones who began the festivities marking this week’s celebration. Meeting at the Metropolia Center for their 71stConvention were the members of the Ukrainian Orthodox League. The event spanned many days, with the members attending various sessions which reviewed the activities of the previous year and made plans for the upcoming years. 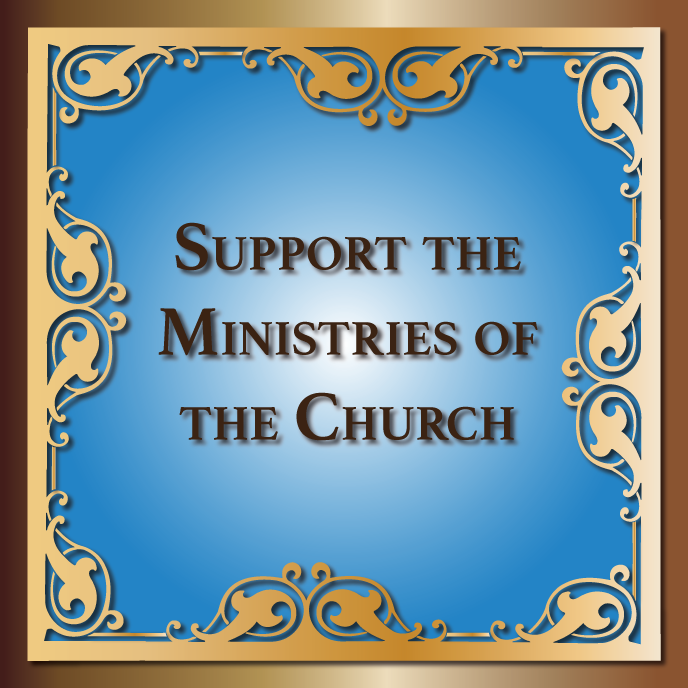 The UOL is active in supporting various Church charities, building fellowship, and retaining the youth in the Orthodox Church. The local hotels swelled as the UOL members where joined by hundreds of guests who arrived via train, plane and automobile to celebrate the Centennial. The first official event was held on Thursday evening in the Cultural Center as the Centennial Museum Exhibit “Ukrainian Orthodoxy in the New Land: 100 Years in the United States of America”. As the crowds gathered in the Narthex of the Cultural Center, Natalia Honcharenko informed the gathered crowd about the progress of the museum, and on the antiquities they would view in the temporary Centennial Exhibit. His Eminence Archbishop Antony greeted the guests, introducing the visiting hierarchs (Metropolitan Yurii and Bishop Andriy of the Ukrainian Orthodox Church of Canada) and guests who had traveled from Canada, the United Kingdom, Belgium, France and Australia. His Eminence took a few moments to express his gratitude and asked that everyone take a moment to carefully view the exhibit, taking a look at the early years, appreciate the efforts that had been made, and to perhaps learn from the past on how to build a better future. With these words, His Eminence led the way to the exhibit, taking time to personally point things out to individuals. As some excitedly pointed to photos of their own parishes, amazed by the old black and white photos, others were mesmerized by antique vestments. In the corner, a prayer room as set up. The faithful entered quietly and prayerfully to view ancient chalices and venerate relics. As the people drifted about viewing the exhibit, others made their way back to the narthex of the cultural center to enjoy some cocktails and fellowship. Over hor d’oeuvres some noticed the commotion inside the auditorium of the cultural center and drifted inside to see what was happening. Inside was a presentation of the Strategic Planning Committee, reviewing what has been accomplished over the previous months, and what is planned for the future. Those gathered were wowed with the progress – the welcome packet, the common logos, the social media presence, the youth ministry, parish rejuvenation, and the new phone app, which everyone downloaded and tested out. As those gathered exchanged contact information and ideas to expand the strategic initiative, the evening wound down and everyone slowly made their way out of the cultural center and back to their hotels. The following morning a herd of deer grazed peacefully in the meadow at the Metropolia Center, accentuating the bucolic scene where the domes of St. Andrew Memorial church glimmering in the early light above the trees. The deer startled as a flock of geese took wing, disturbed by early visitors to the cemetery in search of departed loved ones, in search of history, and in search of a common bond between the past and the present. The tomb stones glistened with the night’s rain, the water droplets glistening like diamonds upon crosses, dripped from angels’ wings, and dampening their cheeks like tears. Visitors from far and wide, stepped around the various monuments, pausing to pray here or there, pointing out this parishioner, that poet, or a heroic figure from Ukrainian history. As members of the UOL continued their sessions in the Cultural Center, guests took time to walk the Meropolia grounds, marveling at the beautiful vistas, the babbling brook, the flowering hydrangeas and beautiful architectural structures. This was the first visit for many, while for others it was a chance to introduce the next generation to the Church center. People wondered the entire campus, perusing the many tomes in the St. Sophia Seminary Library, visiting the bookstore, marveling at the rotunda, wondering over to the Seminary and being amazed by the Three Holy Hierarchs Chapel, eventually finding their way to St. Andrew Memorial Church. The entire Metropolia Center was abuzz, as visitors and guests wondered the grounds, settled in small circles to chit chat, and wonder off in groups to have lunch and enjoy each other’s company. All too soon the day began to wane, but, the excitement didn’t diminish, but, grew as everyone slowly made their way back to the Cultural Center to enjoy the evening’s concert. The program would feature world-renown performers: Ukrainian Chorus “Dumka”, Women’s Bandura Ensemble of North America and “Kyiv” Ukrainian Dance Ensemble (Pittsburgh, PA). As the audience arrived, filling the auditorium, the lights went down, and the curtains opened to reveal the “Dumka” Choir, silhouetted against the colorful backdrop of the Centennial logo with Christ in the middle. The choral voices were raised in prayer, singing hymns and praising the Lord, bringing goosebumps and tears to the eyes of those who sat mesmerized in the audience. After a short intermission the second half of the show featured an interpretive dance program by “Kyiv” Ukrainian Dance Ensemble (Pittsburgh, PA), accompanied by Women’s Bandura Ensemble of North America. The performers told the story of the earliest immigrants who fled persecution, traveled to America, and established churches in order to preserve their Faith and grant haven to their families. The audience was mesmerized by the story transpiring on the stage before them. The final number performed brought tears to everyone’s eyes, as the choir sung Alleluia and the dancers twirled and swayed, the girls’ white dresses flowing ethereally about them. Wiping their tears everyone got to their feet in a standing ovation. A concert on such a high level, intermingling Faith, tradition, history and current events in a musicale had never been experienced before, and would not be soon forgotten. It was from this intense experience that the faithful gathered on Saturday morning, to walk in a procession to mark the Centennial. Still buzzing about the concert everyone marched from the Consistory, past the Seminary down the street to walk before the statue of St. Olga and finally turn in to the drive of St. Andrew Memorial Church. The sun beat down hotly as faithful squeezed in beneath the white tent set up before the Memorial Church. Along the periphery were a number of podiums with Gospel books and crosses, where priests waited to hear the confessions of the faithful. Never before had so many people gone to confession, a steady line forming throughout most of the Liturgy. It was a joy to see so many faithful participating in the Sacrament on such a momentous day. While this was a joyous occasion, there was a pang in everyone’s heart, and many shed tears upon hearing the Gospel reading about the sheep knowing their shepherd’s voice and following him, for their own shepherds were unexpectedly absent. His Eminence Metropolitan Antony had been involved early that morning in an automobile accident and was currently undergoing tests in a local hospital, and Archbishop Daniel was in Ukraine to represent the Church in Kyiv during their celebration. As the Liturgy climaxed and the faithful lined up to share the common Cup. It was a once in a lifetime event, partaking of the Eucharist under the clear blue sky, with the domes of St. Andrew Memorial Church gleaming before them. The experience was surreal and would live in the hearts and souls of the faithful for the remainder of their lives. His Eminence Metropolitan Yuriy of the Ukrainian Orthodox Church of Canada, His Grace Bishop John of the Antiochian Orthodox Christian Archdiocese, His Grace Bishop Andriy of the Ukrainian Orthodox Church of Canada, His Grace Bishop Saba of the Georgian Orthodox Diocese of North America concelebrated the Divine Liturgy with about 100 clergy of the UOC of the USA and in the presence of His Eminence Archbishop Demetrios of the Greek Orthodox Archdiocese of America, the Exarch of the Ecumenical Patriarchate of Constantinople. The mixed choir, under the leadership of Dr. Michael Andrec, from about 12 parishes of the UOC of the USA chanted the responses to the petitions of the Divine Liturgy. 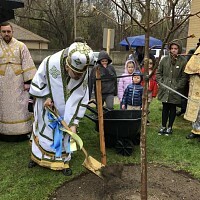 Clergy, representing the Orthodox Christian jurisdictions of the Orthodox Church of America and Serbian Orthodox Church concelebrated the Liturgy. In attendance were also the hierarchs of the Ukrainian Greek-Catholic Church – Bishop Paul of Stamford, CT and Bishop Andriy, Administrator of Philadelphia Archdiocese. Moreover, clergy representing the Roman Catholic Archdiocese of New York, NY and Metuchen, NJ were in attendance. Having concluded the Liturgy, everyone walked past the cemetery, once again stopping to pay homage to those who planted the seed, which blossomed this day. Walking along the white bridge across the brook people paused to cool off in the shade of the trees, before continuing on to the Cultural Center to enjoy the Centennial Banquet. Entering the banquet hall, which was sold out and filled to capacity of 550 seats, everyone caught their breath at the beauty before them. The tables were set with crisp white linens, accentuated by blue napkins and chair swags. Each table was adorned with a bouquet of cornflowers, sunflowers and red roses, accentuated with wheat stalks. Each place setting not only had a place card personalized for each individual, but, also included the Centennial Almanac which featured the history of the Church, as well as individual parishes. Everyone was awed by the blue card that lay upon the booklet. As they opened the card, a precise paper model of the St. Andrew Memorial Church popped up. Everyone was seen opening and closing, and opening and closing the card again and again, mesmerized by the ingenuity behind it. As the members of the head table were seated, the opening prayer was recited, and the meal of tenderloin, salmon or vegetables was served. As people enjoyed the delicious meal, children ran around enjoying time with their new friends. In the center of the hall stood a large cake, lovingly made in the shape of a numeric “100”, composed of five layers with raspberry mouse and custard filling. The cake topped off the meal, being served with aromatic coffee. As everyone enjoyed the scrumptious dessert, His Eminence Archbishop Demetrios took the microphone sharing his amazement at this high caliber celebration, mentioning the pop-card, and all the details which were loving applied to make this event special. He mentioned how our ancestors had fled persecution, came to a new land, and made a new home for themselves and their children, and most importantly preserved the Faith by building this Church, which we celebrate on this day. Everyone sat and listened intently as various individuals came up to the microphone to speak, among whom was Ambassador of Ukraine to the United States of America Valeriy Chaly, who presented a greeting from the President of Ukraine Petro Poroshenko. Just before the entertainment portion of the afternoon began, Fr. Victor Wronskyj, Vice President of the Consistory presented His Eminence Archbishop Demetrios a Cross and Panagia set to commemorate this event. The gift brought His Eminence to tears as he gratefully accepted it. With the formalities concluded, the stage curtains opened to reveal a stage filled with dancers wearing traditional Ukrainian costumes. As they danced, the audience broke out in smiles their hands clapping, while their feet tapped to the beat. As the girls twirled, their colorful ribbons flying through the air, the men perform unbelievable acrobatics. All too soon the performance concluded, however, as the people descended the steps of the Cultural Center they still had a song in their heart, and skip in their step. Hesitant to part with their friends many once again floated across the campus, slowly walking over the bridge, wondering through the cemetery, praying in the chapel. The hot humid air was stirred by a cool breeze floating over the cemetery, the whispers of the souls resting there encircling their descendants, whispering in their ears, stirring their souls, and encouraging them to keep the Faith and persevere through whatever society throws at them. People stopped in their steps and looked around as if feeling the presence of those who lay there, before reaching down their hands to clasp the tiny hands of their own children, and leading them away from the center and back to the world, fortified, and re-energized to continue the work that had begun 100 years ago. There is little doubt that the future will see a second Centennial celebrated of the Ukrainian Orthodox Church of the USA. Until that time, the faithful, guests and visitors will remember and reminisce about this week’s grand celebration. This week-long celebration stood as a testament to the strength of the Church, which is built on a strong foundation, supported by exceptional hierarchs who put their heart and soul into ensuring the faithful entrusted to their care are well served, strengthened in the Faith and safely led through the turbulent seas of life to safe harbor and salvation. May the Lord strengthen the Church, bless the faithful, and grant our hierarchs good health and many blessed years! Mnohaya Lita! Eis polla eti Depsota!!! !